I have to say I feel rather privileged to be the first person in the library to get my hands on this beautifully covered book. It was a bit of a monster in size and page count, but I made it to the end and I wasn't disappointed. This book is the third and final part of the Chaos Walking series. The previous two books are reviewed here and here. My aim is not to include any spoilers, but if you haven't read the first two, then I would advise you to stop here. 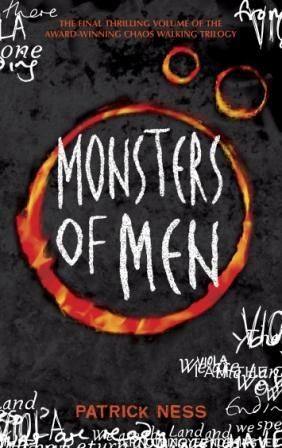 Monsters of Men finds the world on a brink of a three way war. The Ask are ready to fight The Answer and the Spackle are ready to kill them all off. Poor Todd and Viola are caught in the middle and end up being separated and on different sides of the war. The first part of the book is just painful as you see Viola suffering and their friendship put to the test. Can they put an end to the inevitable war and will they ever find peace and unity? For the first hundred or so pages, I really struggled with this book. I felt it needed my full attention and I just didn't have time to give it to it. I had forgotten a lot of what had happened in the previous book and I found that not a lot of back up information was available in this final book. This is the first book I have come across, where I would categorically state that it could not be read as a stand alone, as you would be lost within minutes. Once I found my feet with this book, I was running again faster than lightening. This book had all the intensity of the first two and more. By the end of the book, I was practically screaming at the pages, like an England supporter after a recent World Cup match. Urging Viola and Todd to make the right decisions, to end all the disasters occurring. In this book, a third voice is added to the story and you get to hear about the events through the eyes of the Spackle. That was a little confusing to begin with, as being aliens, they don't talk in the same way as we do. Luckily I caught on quite quickly and began to understand what they were talking about. This book definitely shows Todd and Viola coming of age and I almost felt like I should be attending their prom after watching them grow from pre teens to teenagers over the series of books. I felt a motherly affection for both them and felt so proud of their achievements by the end. One of my favourite characters has to be Angharrad, the talking horse. I know that sounds mad, but Ness makes his talking animals so believable that you cannot help but love them. This book definitely deals with the struggle for power as everyone tries to take control of the war and the future of the world. The fact that is reveals and discusses how 'war makes monsters of men,' shows the reality of the wars in our world, where the tyrannical powers that be put our poor boy's lives in danger on the front line of war. Mayor Prentiss takes his power struggles to a new height, when he develops changes with the Noise to aid his road to Power. He appears to have swallowed some happy pills through out the book, but you soon realise it is all an act and that he is still as nasty as ever. I was very pleased with how the book ended and I am happy to walk away from the series now knowing all my wishes have been answered. My only niggle with the book was that it was incredibly long and might have been more intense, if it was shortened a little. I have loved this series and I have to agree with Alyce from At Home With Books, that if you loved The Hunger Games series, then you will love this trilogy too. It is one of the best dystopian series I have read so far. I only wish that quality YA books like these ones had been available when I was a teenager. And Angharrad <3 Boy colt, boy colt... how can anyone not love her? Hmm, not too sure about this one. I didn't really like The hunger Game books so am doubtful if I'll like these. Still never say never. Arghhh, I need this one right now! Nymeth - LOL, you are soo right! I have never heard of an author killing off all his fans yet. I want a talking animal. Happy to have a dog like Manchee or a horse like Angharrad! Tracy - Probably not the right book for you then, if you didn't like The Hunger Games. Dystopian YA really is an acquired taste. Blodeuedd - run, run as fast as you can to get it! I just finished reading this series, and I had to read them one after the other. I completely fell in love with these books and know I will read them over and over. I really think these books are destined to become classics. Hmm, I have heard so much about this series that I may have to give it a whirl! Nice way to get a dystopia fill before the last Hunger Games book is out, anyway! I need to get this for my hubby - I'm sure he'll love it. Oh it was so wonderful...I miss it so much..sigh. It was a long book, but I just zipped through this one, lol. And by the end, I found myself just wishing it wouldn't end. I didn't want the series to be over. And I want a talking animal too!! Great review! I dont usually read this genre, but youve peaked my interest. I haven't read the first two so I'm going to heed your advice. I'm interested in reading this series!